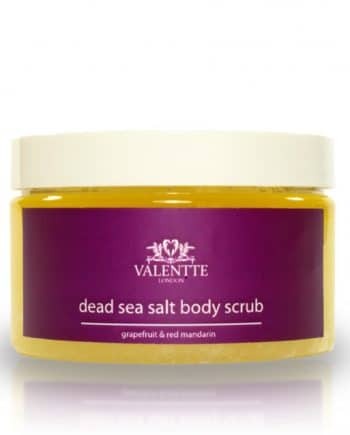 Enriched with jojoba oil, sweet almond oil and mineral rich dead sea salt, this scrub offers gentle, yet effective, exfoliation. It helps eliminate dead cells, while preventing skin from becoming dehydrated. Skin is left perfectly smooth and soft. Incredible aroma, leaves skin feeling really soft i have raccomanded to my daughters too. The lemon grass and rosemary body scrub and lotion were sent as a gift and as yet I can't comment beyond the fact that the recipient was very pleased with them but has yet to use them. Please see my more detailed review of the White Neroli and Lemon body lotion. Smells Devine of fresh lemons leaves your skin soft and smooth and makes your body lotion slide on love it! 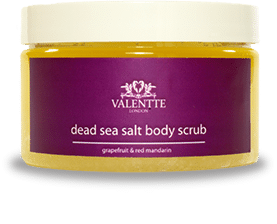 Discovered Valentte some years ago at a craft fair and have been using the products ever since. Impressed by the quality of the essential oils used. This body product leaves the skin soft and beautifully scented. Love it. Our Dead Sea Salt Body Scrubs contain more oil than is usual. Perfect for sensitive skin. Use on dry skin and feel the magic happen. You won’t need hand cream or body lotion on afterwards. Your skin will feel incredibly soft and smooth.